There are numerous types and sizes of gantry cranes in use all over the world for many purposes. They all basically consist of a hoist that is attached to an overhead trolley, the trolley being fitted to single or double steel I beam supported of a building's structure or vertical steel legs. In the next few sections we will examine the operation and applications of several types of gantry cranes. The first section gives a brief overview of this type of crane. The cranes have been used for many years. Demag Cranes and Components Company iscredited with the design of the first one that was steam driven. I well remember seeing some old, but perfectly working examples of these steam cranes in the Belfast Docks, with a mixture of steam and coal smoke emitting from the small stack-pipe sticking out the roof. I also noticed a few of these still nimbly dodging about on their three small rubber wheels on the quayside of the ships outfitting channel in the shipyard of Harland and Wolff in the early sixties whilst serving my apprenticeship. These are such a far cry from the massive Samson and Goliath cranes that span the dry-dock and that are visible from miles around the shipyard. There are several bodies in the US that support the manufacture of overhead material handling cranes. Crane Manufacturers Association of America and Hoist Manufacturers Institute are the main ones. We shall examine the components of a typical gantry crane running on steel overhead rails mounted inside a building. These are manufactured in various lengths from cast iron having a bottom flange that is drilled for high tensile bolts and nuts used to fix the rails to the building’s main steel work. There are two methods of fitting the bolts. a) Bolts inserted downwards with the nuts fitted to the bolts from underneath. This prevents the bolt falling to the ground should the nut slacken off. However there is no visible warning of a nut missing until it hits the floor (or your head)! b) Bolts inserted upwards with the nut fitted from above. This method allows the operator to notice right away that the bolt is missing as the bolt hole will be visible. However some of these bolts are quite large and heavy. This combined with the height of the rails are also capable of inflicting injury should one fall and hit a worker. The long-travel wheels are also cast having steel flanges and double ball bearings. Two of the wheels are driven by electric motors and two are normally free running. These are contained in the end carriages that are fitted to each side of the crane beam(s). The electric drive motors may be mounted directly onto the driven wheels or mounted on the cross-beam and driving the wheels via a drive shaft. 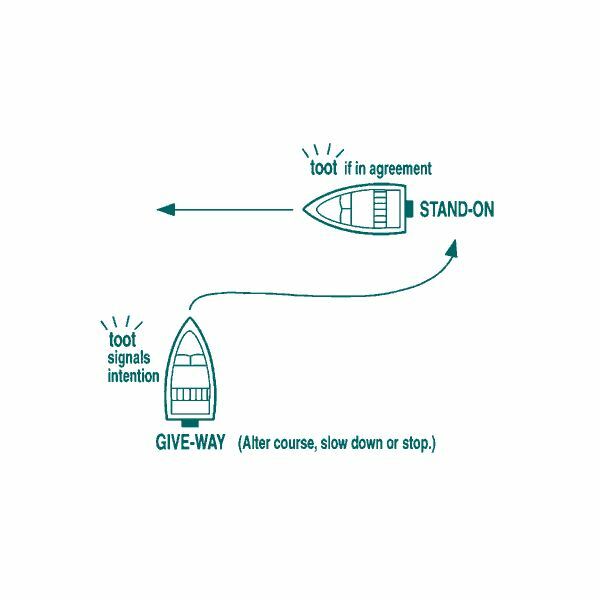 It is very important to have these long-travel drive motors synchronized to stop and start at the same time as any time lag at all will result in the crane “crabbing" (the name given to the ‘Z’ action that the crane adopted on starting). I was engineer at an aluminum smelter here in the North of Scotland for many years. The cast shop had four overhead gantry cranes of 50T & 20T capacity. The 50 tonners were used to transport molten aluminum in steel crucibles to the holding furnaces, prior to casting. One particular crane was prone to crabbing, which was a dangerous situation to be in when travelling up the shop with a crucible of molten metal hanging from the hook! We tried numerous times to get the motors synchronized to start together at the same time. One quite weekend nightshift, I operated the crane and the electrician and fitter observed the drive motors as I stopped and started the travel. We suspected backlash in the drive gears and shafts, but eventually we traced the fault to the magnetic brake on one motor that was lagging ever so slightly behind the other one. Once we adjusted the clearance and greased the linkage, the crane worked satisfactorily. Some years later the smelter closed and the cranes and the equipment were sold to a smelter in Dubai. I applied for an engineer’s post out there and was flown to the plant for final interview. I was being shown around their cast shop and lo and behold; up above me was one of our old overhead cranes. I mentioned this to the plant manager and he said they were excellent cranes (Vaughn’s I think they were) except for their crabbing! I was able to tell him how to put this right. In the end I was offered the engineer’s job, but turned it down accepting an alternative position with a local oil and gas offshore construction company. Anyway, this is one thing to look out for that can be very dangerous when lifting and transporting heavy loads; especially when maneuvering in tight locations. The bogie is electrically driven and houses the main hoist. 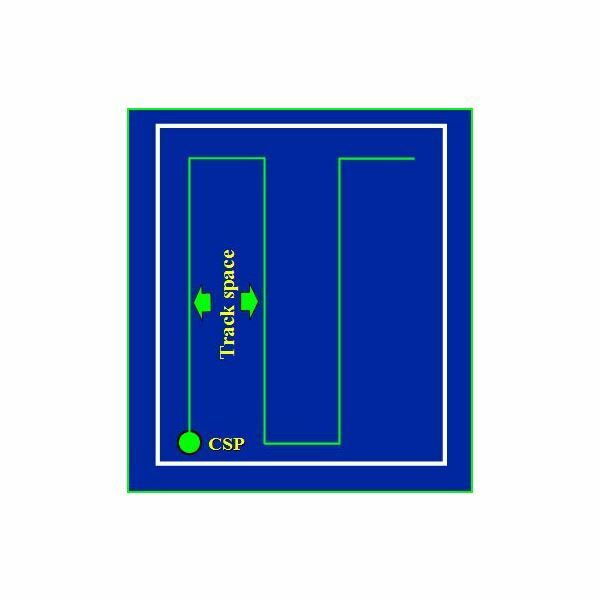 It is under-slung on a single beam or suspended between two beams in a double beam design. The electric drive motor enables the bogie to cross-travel along the beams. The hoist is mounted on the cross travel bogie and consists of a steel drum around which the coils of wire rope are wound. It is electrically driven and has the normal magnetic brake that operates on raising or lowering the crane hook, whether loaded or unloaded. Accessed by a set of vertical looped ladders, the cab is located at one end of the overhead beams and gives all-round vision to the crane operator. The long travel, cross travel, and hoist are normally hand operated from a control panel convenient to the operator’s seat, with an emergency long travel hydraulic foot brake on the floor of the cab. 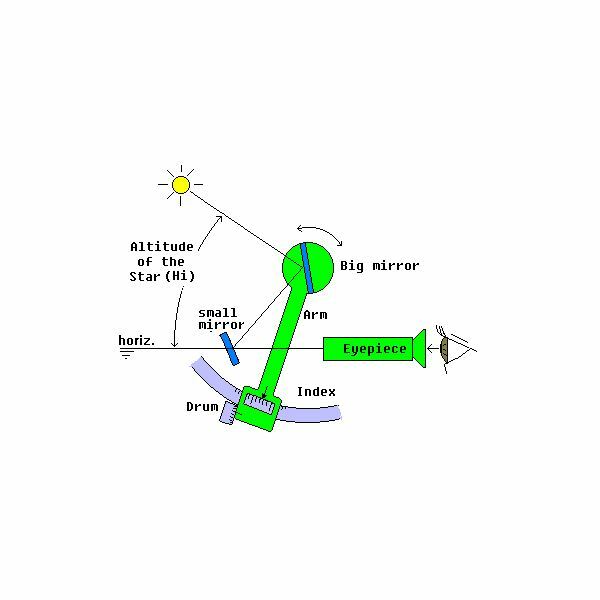 A sketch showing the components follows. We shall examine the application of three types of gantry cranes. These are normally mounted inside buildings and have the steel overhead rails bolted to the building walls or supporting steelwork. The crane has end carriages attached to each end of its overhead beams and these contain the drive wheels. This arrangement allows the crane to travel along the full length of the building with the cross-travel trolley giving access across the width of the building. The cranes are used to lift, transport, and lower heavy items around the building floor area. 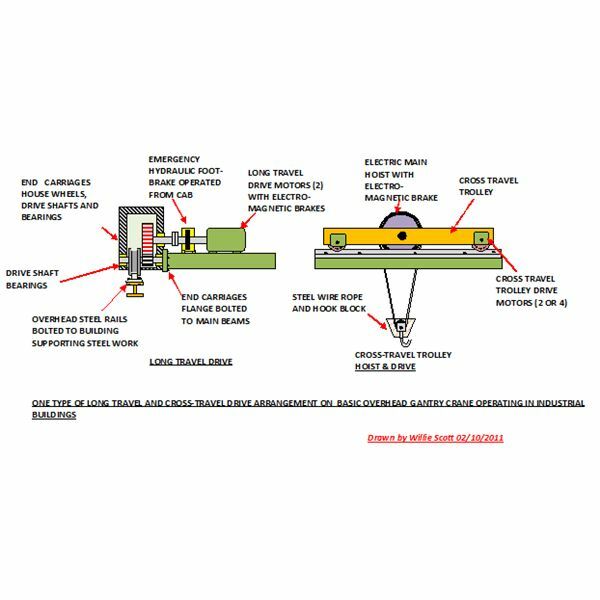 These use the same type of hoist and travelling system as the previous overhead crane except the rails are at ground level and the crane beams are supported on vertical steel legs. This allows for loading and unloading train cargo/freight with the crane straddling the railway line and the carriages located under the crane. A typical example is shown below. Modern shipyards use this type of crane straddling a dry-dock where large fabricated sections of ships hulls are joined together. These are transported by the crane from the fabrication shops to the bottom of the dock and hold them in position while the sections are welded together forming the hull. 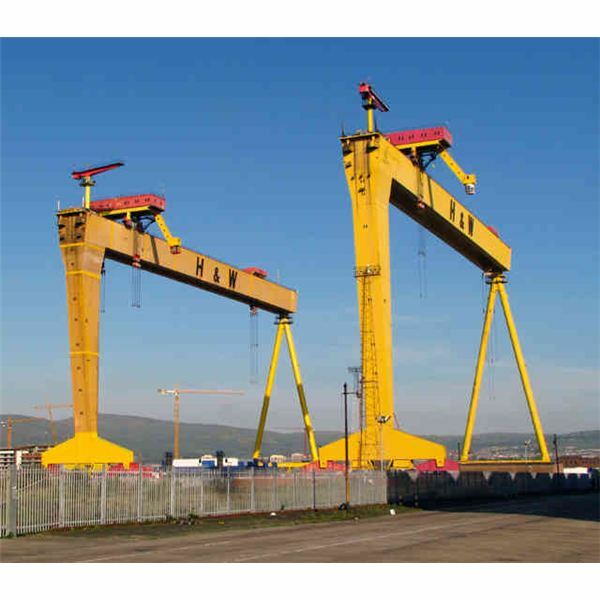 An example of this from my old shipyard of Harland & Wolff Belfast is shown below. Operate on the ground on rubber tires. 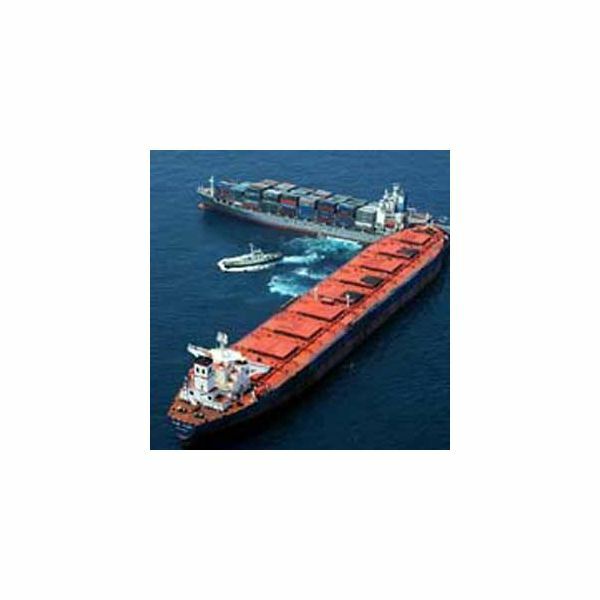 These are extensively used in container terminal storage yards for locating, shifting, and stacking containers. The main beam(s) and hoists are supported on vertical steel columns that have rubber tired wheels at the base. These wheels are driven by electric motors; two of them being used to steer the cranes. There are examples of the above types of cranes in the References section at the end of the article.